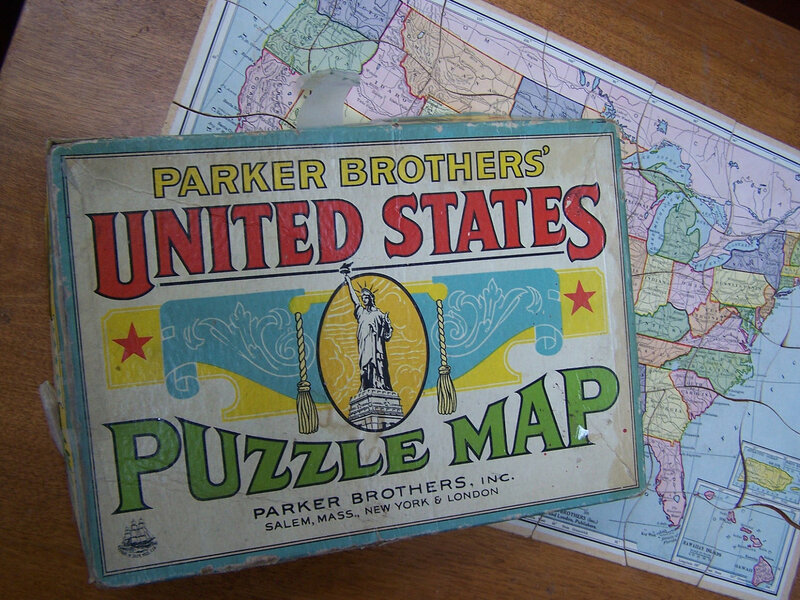 etsyThe first two weeks of States are down and the results aren’t overly surprising. Zekrom/Eelektrik NVI and Celebi Prime/Mewtwo EX/Tornadus EPO seem to be the largest threats, but at the same time we’re seeing a lot of diversity in the top cuts. I do feel the format is a bit too fast, and certain cards a bit too broken (mainly Junk Arm). These complaints are minor though and overall I find this is the healthiest format the game has seen in a while. Due to the fact there are 3 weekends for States this year vs. only 2 weekends in past years means players have more opportunities to travel. This makes States tournaments a lot more competitive and a lot larger than they have been in the past. This also means all of your card choices are much more important and can have much more of an impact. We still have the 3rd week of States ahead of us, so it’s not time to rest just yet. I’m ready to hit this last week hard and hopefully after my article you will be as well. I finished Top 4 in Nebraska States week 1, and I won Wisconsin States this past weekend. I’ll break down the lists I played and a short report sharing some of the strengths and weakness in my card choices, as well as what I learned. I’ll also share a few other lists I’ve been testing and talk about any surprises that came about during the first 2 weeks. Before I go any further I would like to take a moment to say thank you to Mike Lesky and Sam Liggett. The last minute advice I got from you guys really help me make my last few deck decisions. I didn’t realize at the time just how dramatically these changes were going to help me. 1. I play what I feel to be the best deck in the format, which also tends to be the most played. When I decide to go this route I seriously have to believe that I can outplay people in mirror. If I’m playing the most played deck in the format, I can expect to play against mirror anywhere from 2-4 rounds of a 7 round tournament, and I really don’t want to play that many 50-50 games. Personally, I’m far more likely to play mainstream if I feel the mirror has a skill component to it like Luxchomp or Gardevoir. This is the main reason I avoided playing Typhlosion/Reshiram at Worlds last year, because the mirror was almost entirely luck based. 2. I play a rogue deck that I feel counters the meta has a whole. Due to the power creep and fast format, this is much harder to do nowadays. It was one thing back in the day when both players spent the first few turns setting up. This allowed you time to set up or implement whatever your rouge strategy was. This simply isn’t as feasible when rogue decks can easily be overpowered/donked. I feel even a hard counter to 1 particular deck in this format has no better than a 70-30 match up. This format is also so diverse that it’s very hard to cover all your bases; you may end up with a positive matchup against one deck, but be a clear underdog against another. 3. I play a high risk/high reward deck. What I mean by this is a deck that I feel would give me a strong shot at winning the tournament, but normally it also has some huge inherent weakness. Jumpluff HS is probably the best example of this, it was about the only non-SP deck that could beat SP at the time, but not lose to the rest of the format. Its biggest flaw was the deck ran 4 30 HP Hoppip, so the odds of starting with one were rather high. Both Luxray GL and Garchomp C very easily hit for 30 damage with either a DCE or energy/Energy Gain. I normally try and avoid these decks for the exact reasons I listed above, but sometimes I do feel the possible reward is worth the risk. This was actually a deck we started testing a few weeks before States. 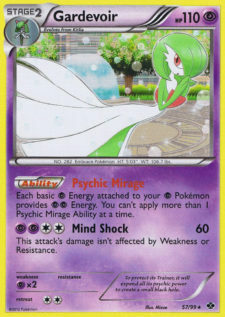 The Gardevoir/Mewtwo EX combo was pretty obvious and did get some early hype, but seemed to fizzle out rather quickly. At first glance I really didn’t like the deck a whole lot since I felt that it relied to heavily on Mewtwo EX and really didn’t have any alternative attackers. The more I tested it though the more I found it going right around 50-50 with a lot of the bigger decks in the format like Zekrom/Eelektrik and Durant. The CMT match up mainly came down to if they got the best turn 1 off, but it wasn’t horrible. 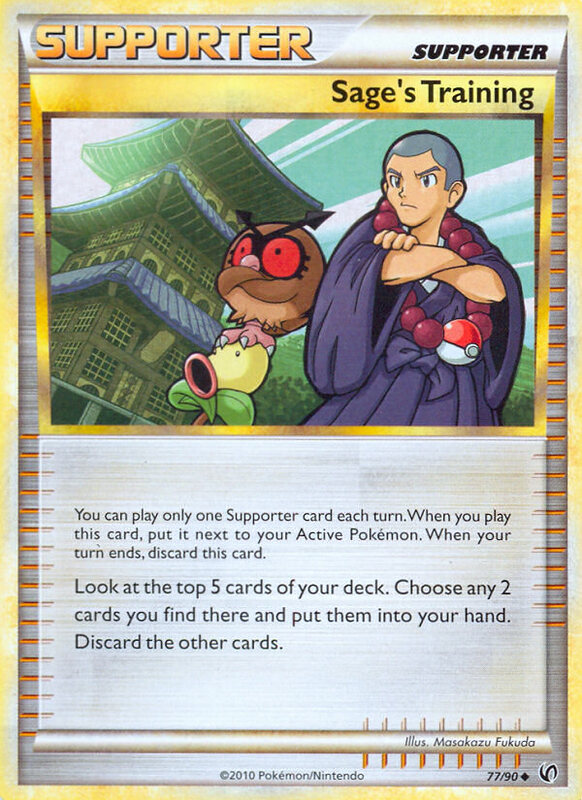 Pokemon ParadijsThe ultimate reason the deck got axed off of my top picks was consistency. The deck would never really open dead, but it would open slow at times. I did everything I possibly could to maximize the Turn 2/Turn 3 Gardevoir, but once again I was trying to set up a Stage 2 in a Basic dominated format. If my opponent was able to pick off a Ralts or 2 before I hit the Gardevoir, I simply could not make the Mewtwo exchanges with them. The only change I would make to my list would be dropping the 1-0-1 Leavanny. It’s really good in theory since it allows me to 1HKO my opponents Mewtwo EX without them being able to KO me with theirs. In reality though, it’s simply to hard to set up, and the 2 spots should be used for more consistency cards. Due to the complete lack of Trainer lock I saw, I dropped the Kirlia (3 free spots) and I’m playing a 4-0-4 Gardevoir and an 8th Psychic Energy. I really don’t think the deck is bad, rather it simply not fast enough for the current format. This is really the issue I’m having with a lot of the decks in the format. So many of them just have so much potential, but are just to slow to be viable, or to weak to Pokémon Catcher. Nebraska was only about a 3 and a half hour drive, so as weird as it sounds I actually got to “sleep in” till about 5:45 AM. I showered and met up with my brother for a pretty uneventful drive. We both decided to run very similar Zekrom/Eelektrik variants. Below is the list I ended up playing for the event. About a week and a half before States my life became immensely easier. I finally finished up a midterm I was working all semester on and got 2 major tests out of the way. This allowed me to really focus on States, but at the same time we needed to get serious. We messed around with a few rogue decks like Mew Prime/Vanilluxe NVI/Vileplume UD and Mewtwo EX/Gardevoir (which I covered earlier). Mew/Vanilluxe/Vileplume seemed good in theory with all of the EXs running around, since it was much easier to make up a prize deficit, but in testing it was just too slow, too luck based, and I didn’t like running 7 Basics (4 Mew, 3 Oddish) that Mewtwo EX could donk. As for the Mewtwo EX/Gardevoir deck, it actually tested much better than it looked on paper. Surprisingly it was actually going about 50/50 with the tier 1 decks. The problem was it just wasn’t consistent enough for me. I won’t bore you guys with a full breakdown of my States deck, but I do want to hit on certain card choices and why I played certain numbers. 3 Mewtwo EX: I played 3 copies because it made the exchanges easier. I didn’t have to worry about 1 being prized or panic if I discarded 1 with Sage’s. 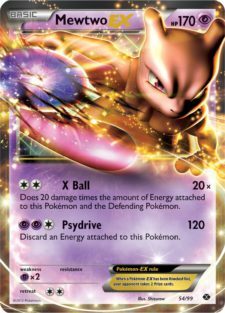 At the end of the day though I don’t feel the extra Mewtwo EX won me any games outright, but I don’t feel like it hurt me either. 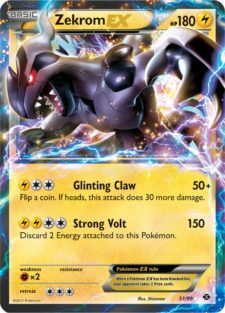 1 Zerkom EX: The more I played the deck the less I found myself attacking with Zekrom EX. It was essential in certain matchups like Typhlosion and Magnezone (basically against any Stage 2) which made me want to run 2, but I just didn’t have the room so it got cut pretty early. 1 Terrakion: We played the 1 Terrakion for mirror. It had uses in other matchups, but not to the point to warrant running it. On paper the card looks like a staple for mirror, but in reality it was less a staple and more of a solid choice. 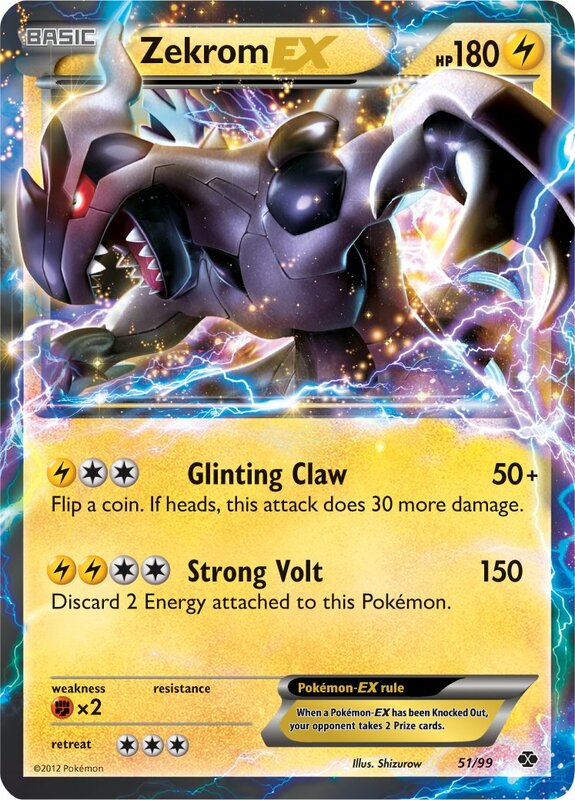 It caused varying levels of problems for a Zekrom EX/Eelektrik opponent depending on the situation. 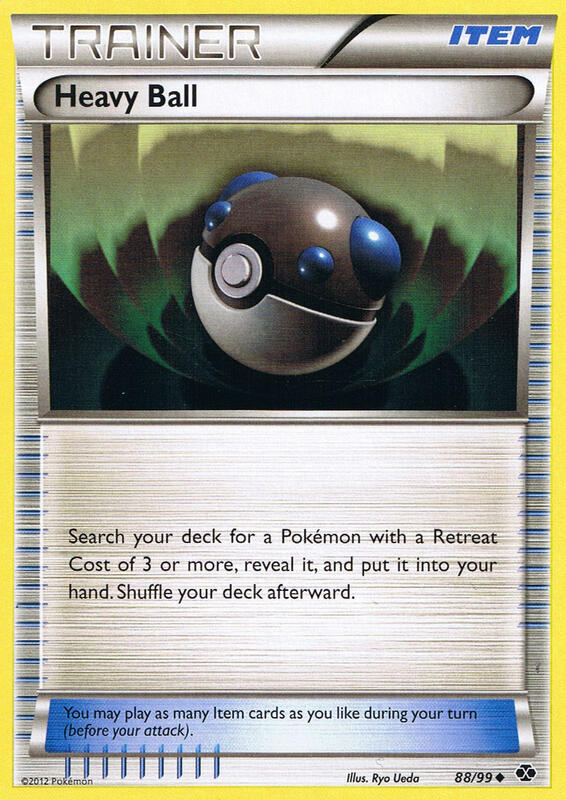 If they went very aggressive with Zekrom EX it was amazing, however against anything else you were simply making a 1-1 trade off, which is something the deck should be able to do easily anyways. To go along with this, the 2 Fighting Energy and 1 Terrakion were hard to find at times. Not difficult per se, rather it didn’t always pop into my hand right when I needed it. I played 6 mirror and I feel like it was a dramatic help in 2 of them. 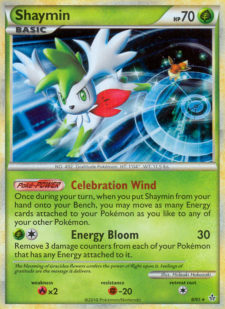 1 Shaymin: Shaymin allowed me to move energy around and more easily power up attackers quickly. 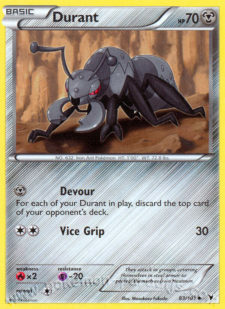 It was also very useful in the Durant match up since it made it harder for them to lock an Eelektrik in the active spot. The card is also easily searched out with Pokémon Collector, so you have easy access to it. 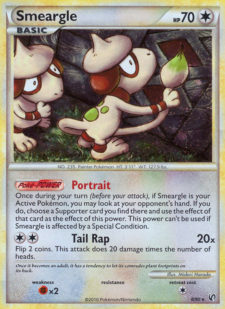 3 Smeargle: I stole the Smeargle idea from Tom Hall after he made Top 8 at the ECC with the deck (although a very different list). Alright, to be very honest, perhaps I took the Smeargle idea from my brother who got it from Tom Hall. Anyways, Smeagle added consistency to the deck while also giving me a 70 HP opener. Since I was run 3 Tynamo and 1 Terrakion (none of which I wanted to open with), the 3 extra Basics were something that factored into my decision. It came at the price of about 5 spots (3 Smeargle, 2 Bridge). The big thing we learned from testing (and paid dividends in the tournament) was don’t get overly aggressive with the Portraits. There is so many “shuffle and draw” and “discard” Supporters in the format you had to be very careful. If I didn’t need to Portrait I normally wouldn’t, especially if I couldn’t afford to lose my current hand. 2-1 Tynamo: At the event and after seeing what other people played I would say the standard was to go 2-1 Tynamo (30 HP – 40 HP) or 3 Tyanmo (30 HP). There were still enough threats in the format (Tyrogue HS, Chandelure NVI/NXD, Kyurem NVI) that I was never going to play a full 3 copies of the 30 HP Tynamo. I debated going 2-1 (30-40), but I figured that I would be more likely to find myself in a bad situation due to only playing 1 of the 40 HP Tyanmo than I would be opening with the extra copy of the 40 HP. Playing the 2 Skyarrow Bridge made this decision much easier for me as well than it would be for a standard Zekrom/Eels player. Pokémon Communication vs. Level Ball: I would call the Communications a personal preference over a must. We tested both, and found each had their pros and cons. Early in the match due to our low Pokémon count, it wasn’t uncommon not to have a Pokémon to match with Pokémon Communication. It’s very hard to Juniper away a Communication wishing it had been Level Ball, or being forced to grab a Pokémon off Sage’s you really don’t need just to send it back to the deck. On the other side of this though, later in the game we found ourselves with Level Balls when we needed Communication to grab one of our heavy hitters. Both scenarios seemed to occur with the same frequency so we choose in our minds the lesser of two evils. We considered a 1-1 split, but decided against it due to the same issue of having the opposite copy of what we needed at the time. No Eviolite: This was actually one of my last cuts from the deck; it’s amazing how often having 20 more HP will turn a 1HKO into a 2HKO. 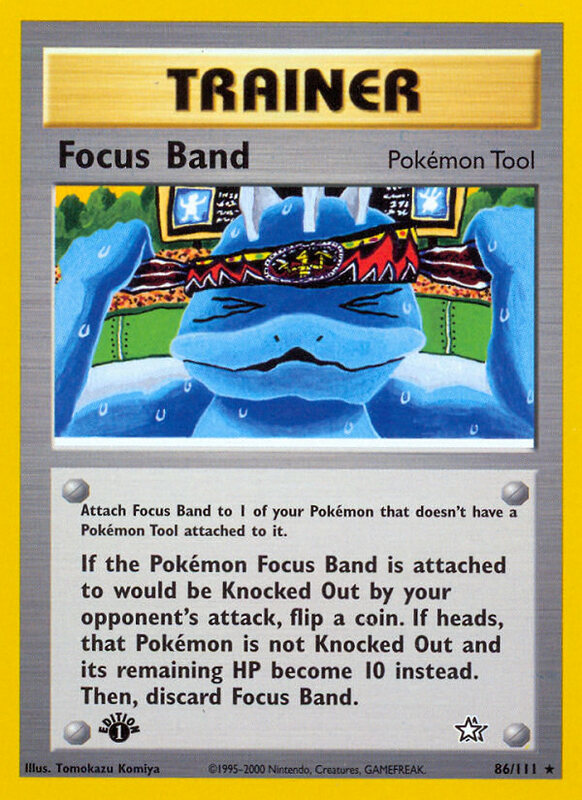 Ultimately it got cut because Eviolite is a very defensive card. My opponent could always see it coming and in many cases simply play around it. In other cases they could simply Catcher around the Pokémon until they were able to deal with it. No Zekrom BLW: This was our big mistake of the tournament, neither my brother nor I ran a copy of the BLW Zekrom. We were tight on room and to fit it in we figured we had to cut either the 3rd Mewtwo EX or the Terrakion. Neither of these were cuts we wanted to make in what we assumed to be a field of Zekrom/Eels. The only matchup we found Zekrom to be essential in is the Durant matchup, and since it far from guaranteed us a win against it, we opted to cut it. Looking back it seems really stupid, but at the time it made a lot of sense. My brother and I left around 6:30 in the morning to make the 3 and half hour drive to Nebraska. This was a little different because this was actually going to be the first tournament of the year that my brother and I were going to be in the same division. Didn’t really change anything in how we prepared or the decks we ran. We played a Zekrom/Eels variant that we both spent the last week really refining. My brother ended up going 4-2 in Swiss and missing on resistance, but here are his results. So I made the Top 8 at I believe 4th place, with my resistance end up being really good even after the round 1 loss. The Top 8 was pretty diverse with 3 Durant, 3 Zekrom/Eels, 1 CMT, and 1 Typhlosion/Reshiram. This was actually a really close games and one of the most fun ones I played in the tournament. I was pretty happy to see Durant play against Typhlosion/Reshiram in the first round of Top 8. But when I looked over about half way through my Top 8 matchup, I saw the Typhlosion player “set up” with stuff like Reshiram and Ninetales on the board. I don’t know the player or the situations he was forced into during the game since I was pretty focused on my own game, but most of the time the Typhlosion/Reshiram player wants to set up nothing except for 2 Typhlosion Prime. 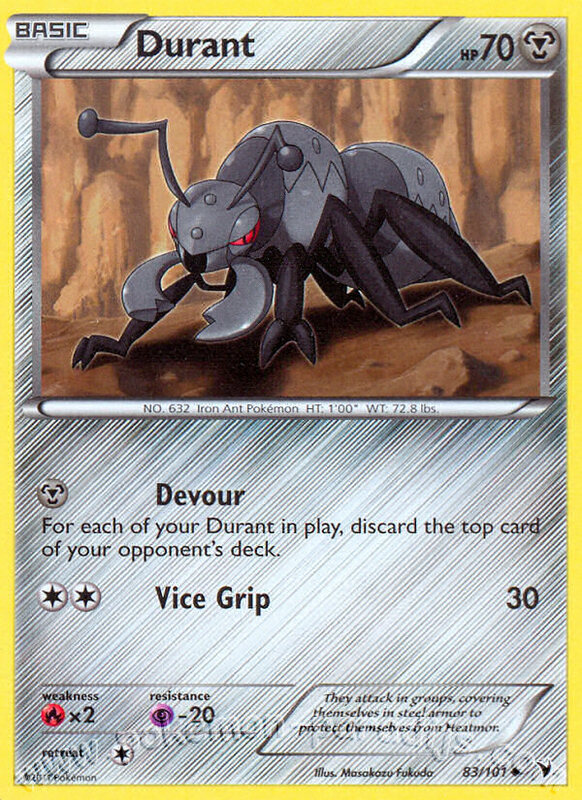 This allows the deck to easily run through Durant without wasting cards (which speeds up the deck out). This isn’t always possible (sometimes you’re forced to start with another Basic), but this is the ideal situation. Pokemon ParadijsIn the end the Durant player ended up winning and I went from a very favorable Top 4 match to a very unfavorable Top 4 match. Game 1: The early game was pretty much picture perfect for both of us; I got very early Charge off with Thundurus, while he got a Turn 1 mill for 4 off with his Ants. I would say I dominated the early game picking off Ants pretty easily. The big turn point was his coin flips. He hit a turn 1 heads on Xtransciever and proceeds to hit his first 3 Crushing Hammer Flips (in the end I think he went 3/4 or 3/5). With that my run came to an end in the Top 4. I feel it was a decent showing, but certainly not as good as I wanted. We took a huge gamble and didn’t really tech well for Durant, and it cost us in the end. This certainly isn’t a gamble I’ll take in the future especially with Durant having some strong showings across the country. I was really pleased that between my brother and I we were 10-0 against any non-Durant deck. Between week 1 and week 2 we were going to work on teching our list for Durant without giving up anything in our other matchups. We were also going to test the Durant matchup a lot more. courthouseloverThe week between Nebraska States and Wisconsin States was my spring break. My spring break overall was very enjoyable and I spent a majority of it working, relaxing and socializing with friends I don’t get to see nearly enough. I had planned to write a paper for school and get some good testing in, but in the end neither of those two things happened. I did test the CMT matchup winning both games we played, and I even debated playing the deck before ultimately deciding against it. I really like the deck, but I was skeptical about my list and didn’t feel comfortable playing the deck. 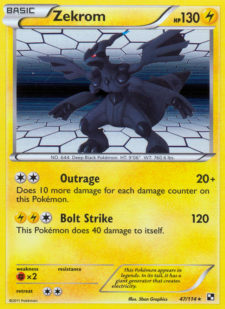 Once I decided against CMT, we broke out the Zekrom mirror and played that. My brother ended up 2-0’ing me by a pretty good margin, which just made me feel better about the deck. I would love to say I did more testing than this for the second week, but I really didn’t. I drove up Friday afternoon and had a great night hanging out with friends I don’t see often enough. I knew this week I really needed to improve my Durant match, but at the same I like how my list was playing so I wanted to keep the changes simple. 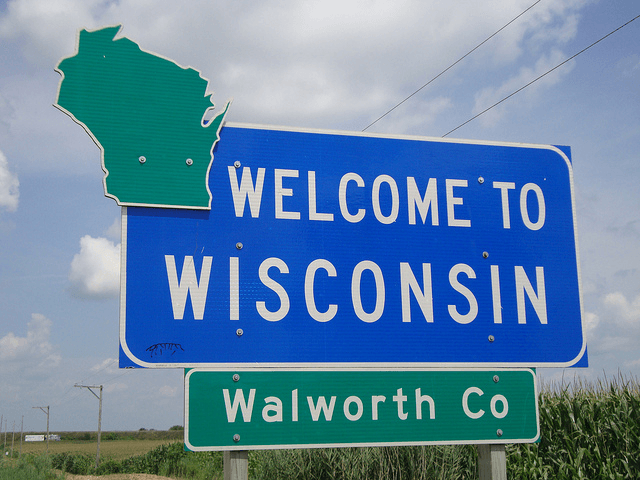 Here is a look at the list I played for Wisconsin States. The change I ended up making was cutting the Terrakion and the 2 Fighting Energy for a Zekrom BLW, Level Ball, and a Lightning Energy. I didn’t drop the Terrakion because it was testinging bad or anything like that. 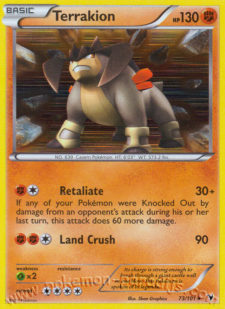 Rather, I was just very tight on room and I saw the Terrakion as more of a tech rather than a staple in the strategy. The Zekrom was mainly for the Durant match up, but it was a solid attacker in nearly every other one as well. The Level Ball allows me quick access to my Eelektrik as well as quite a few other Pokémon. The last change was simply swapping Fighting Energy for Lightning to keep my energy count at 13. The field was pretty diverse and wasn’t at the same time; Zekrom/Eelektrik shared the spotlight at the top tables with CMT, Durant, and Mew (ECC version). Here is how my Swiss rounds went down. Despite taking 2 losses in swiss to Durant, I still feel it’s not a bad matchup. In Round 2 I opened Mewtwo EX and could simply never get enough energy under it to the point where I could 1HKO Durants. Sadly I would have donked his Rotom UD had I gone first. The second Durant loss I took in Round 7 was due to not having any energy in my hand, and I was forced to pass several turns. To be honest, both of these losses bothered me from the standpoint in testing I was doing really well against the deck. Going into the matchup I wasn’t really sure what to expect, as on paper it looks pretty bad. However, in the last round of Swiss my friend (also playing Zekrom/Eelektrik) beat him and swore it wasn’t as bad of a matchup as it seemed. Game 2: He opened Terrakion, attached a Fighting and passed. 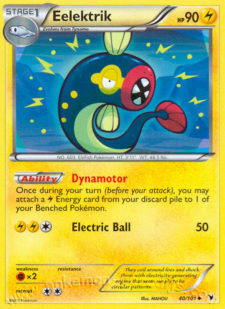 I opened with a 30 HP Tynamo, and Saged for 5 to look for a Pokémon to pair with my in hand Pokémon Communication. I wasn’t too worried when I played the Sage, but as I kept drawing cards I kept getting more and more scared. The biggest thing I learned about playing this matchup is be careful with the Turn 2 drops. The deck is at its weakest for the first few turns when its getting those first few energies in play. Turn 2 the only thing the deck can do is hit you for 30. So avoid dropping those low HP Basics since they can actually be Catchered and KO’d on that second turn. If I go first I can pretty safely drop Tynamo’s, but if I go second and they get a turn 1 energy attachment it’s better to hold them. Once my opponent gets that 3rd energy into play I’ll start benching whatever I want. In this situation there already smacking for 90 and Pokémon Catcher will get them a KO regardless. Brandon was currently undefeated with an 8-0 record. However, this late in the tournament there wasn’t a whole lot of surprises left and I knew about the tech Mewtwo EX he ran. Game 1: He opens with the Mewtwo EX and I open Zekrom EX going first. I get the Turn 1 Lightning drop and the Turn 2 DCE and start swinging. His Mewtwo EX was stranded in the active position, so I was hoping for a better board position before I took the KO and gave him access to Twins. However, Brandon drops a DCE and threatens the KO, so I go ahead and KO the Mewtwo EX. This might seem like a cop out, but this was an amazing mirror match that I can’t do justice to with a short write-up. Kyle should have the full match video online shortly (or up by the time this article goes live). I’ll just say Kyle and I slugged it out for a full 3 games and it came down to the wire. I know that’s a pretty short write-up for the finals, but both games basically came down to me opening better. This let me make better trade offs over the course of the game. 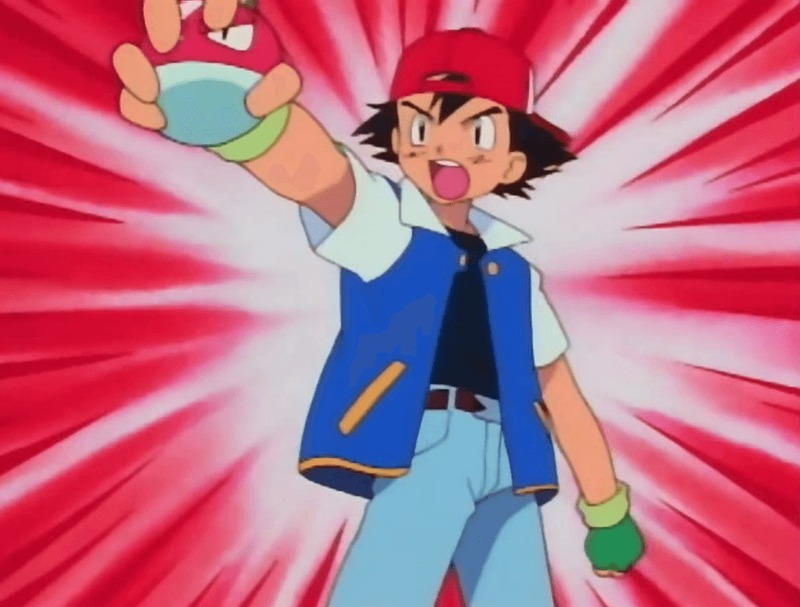 Kyle Sucevich (Pooka) was there in full force and did the best coverage I have ever seen at a Pokémon tournament and he streamed matches live all day including the top cut matches. I really suggest you check out their website at www.thetopcut.net. Every other major card game has some sort of media coverage at major events, and I’m glad that Pokémon is starting to as well. The Top Cut actually isn’t even affiliated with P!P or Nintendo, which will hopefully change in the future. On their website they have some different way you can help them out, or if you like what you see email P!P and let them know how you feel. marktoonPersonally after the tournament I went online and donated $1 to them. I know $1 isn’t much, but I feel if a lot of people in the community did this than it would add up. I honestly feel coverage like they are doing is exactly what this game needs. Many of the owners of The Top Cut I’ve known for years and I feel like they are some of the most respected members in the community. Besides I was just going to use that $1 to buy a pop I really shouldn’t drink anyways. I didn’t really talk much about my top cut games since the videos should be up (or will be shortly) and can provide a lot more detailed accounts. The videos might be a bit long since most of my games almost went to time, but I feel they are a great resource, especially if you want to see how a particular match up might play out. I’m not saying that my way is the only way or even the right way to play against these decks, but hopefully it will give you some insight. Terrakion was about the only real surprise to come out of the first 2 weeks of States. There are two different variants of the deck, the first is straight Terrakion where you only play 4 copies of Terrakion. This is the variant that Curran Hill won Virginia States with week 1. The second is Terrakion/Landorus which won the Canadian Provincials week 2 and I believe (though don’t quote me on it) was created by Colin Moll and Brit Pybas from Missouri, who both earned top cut performances week 1 when they played it. Overall the lists are pretty similar with only a few changes between them. First though, let’s take a look at a straight Terrakion version. Overall I would say my list is pretty standard and really doesn’t have anything to earth shattering. 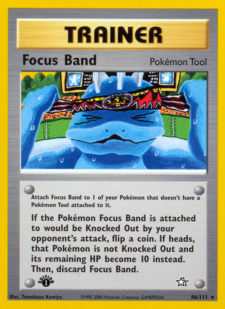 However, I feel with a deck like straight Terrakion that’s exactly what you have to do. The 4 Terrakion are all you run for Basics, which means you probably won’t ever be getting donked, but if I did the math right it puts your odds of mulliganing just over 50%. I feel this is a big enough issue it’s worth mentioning. 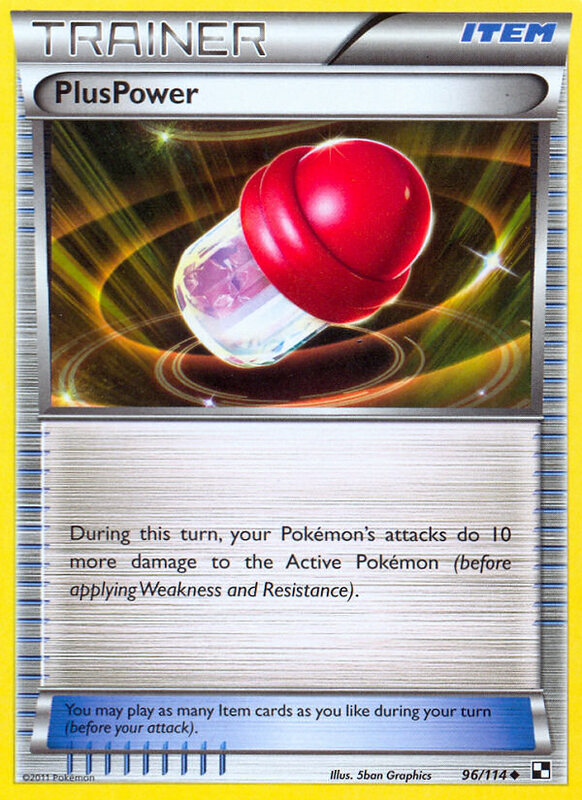 The deck is at its most vulnerable in the first 2 turns of the game while you’re powering up your first Terrakion. Mulliganing even just once or twice at the start of the game is giving your opponent extra resources when you are at your weakest. The Trainer lineup is broken into two parts: set up and consistency, and then your techs. The consistency cards are pretty straightforward, but there are still a few things I’m debating on. I feel 2 N is the play; you could bump it up to 3 or down to 1 and also be fine. The 2 Copycat on the other hand I’m not so sure about… they just feel like a vanilla filler Supporter. PONT and Juniper are by far the two best draw Supporters we have in the format and nothing else comes as close. The other options I’m leaning towards are Bianca and possibly Cheren. Right now none of them feel right. The other thing I’m not sure about is the 4 Heavy Ball, running 4 copies of a card to search out only a possible 3 copies of Terrakion (you start 1) will lead to dead Heavy Balls late in the game. I suppose at this point it doesn’t matter though, but it’s the point in the game you really can’t afford dead cards either. In the end I’m probably going to stick with 4 Heavy Ball due to how crucial they are at the start of the game. I also wanted to keep my techs pretty straightforward. 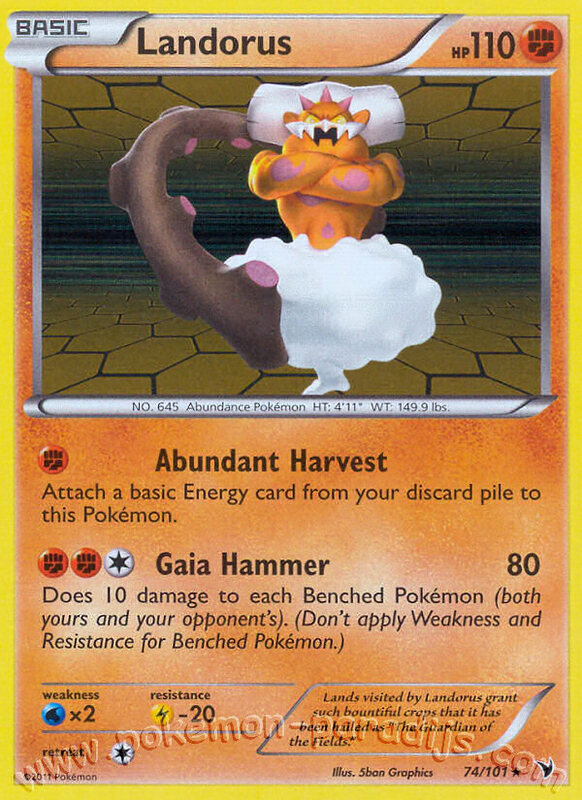 The 4 Pokémon Catcher puts early pressure on the opponent, while 4 Crushing Hammer attempts to slow them down. Junk Arm is a staple at 4 in anything that runs this many and this diverse of a Trainer lineup. The 4 Exp. Share is your way of keeping your energy attachments up at a consistent rate. Originally I had a much higher PlusPower count but found them to be unneeded. In many situations everything was either a 1HKO or a 2HKO and PlusPower didn’t make the difference. I wouldn’t run the deck without any, I just don’t feel 3 or 4 is needed. Same thing with the 2 Lost Remover; 1 or 2 is all you really need, and anything more than that is overkill. The 2 Revive make up your 6 prizes (4 Terrakion + 2 Revive) and the 2 Switches allow for easy switching if a Terrakion gets Catchered or hit. Lastly, taking a look at the energy line up, I went with just 13 Fighting Energy. I actually wouldn’t mind 14, but so far 13 has pretty consistently gotten me the opening energy. The first 2-3 drops are the most important and despite occasionally missing it, I haven’t bumped the energy up yet. Next let’s go ahead and take a look at the Terrakion/Landorus version of the deck. Since the two variations of the deck are very similar, the lists are going to be as well. This time around I went with a 3-3 split of both Landorus and Terrakion. Terrakion at 3 seems to be pretty standard for this variant, but I’ve seen quite a variation in the number of Landorus. I’ve seen lists that ran as few as 1 and as high as 4. 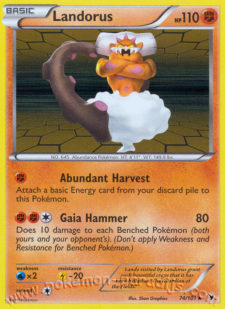 Pokemon ParadijsI also bumped up the energy lineup by 1 Fighting to help with that Turn 1 Abundant Harvest. I don’t feel that the extra Fighting is essential and I haven’t noticed a difference in testing, but it does look better on paper. As for the Trainer lineup, the only real difference I made is the adding of 4 Sage’s Training. Right now Sage’s Training is one of the 3 best Supporters in the game in my opinion. I should be a little bit more careful with that statement I suppose, but it’s just such a multi-purpose Supporter. It’s amazing in decks that like to throw energy in the discard pile. It’s also great for any deck that runs a high Junk Arm count, since it burns through your deck, turning your discard pile into a “toolbox” of sorts. I don’t recommended it for every deck, but it’s amazing in the decks that benefit from the discarding. To find room for the Sage’s Training I made the easy cut of the 2 Copycat, and then I cut PONT down to 2 as well. This was a bit harder of a cut since this lowers me down to only 6 “new hand Supporters.” However, I just feel like 4 Sage’s Training is so important in this build. Since my Pokémon count is now 2 higher and my energy count is 1 higher, I have to find 3 spots to cut from my Trainer Line up. The 1st cut I made is dropping a Heavy Ball. This was pretty straight forward; not a ton of point in running 4 Heavy Ball to search out 3 Terrakion. Next I dropped a Revive. This also wasn’t too hard of a choice. 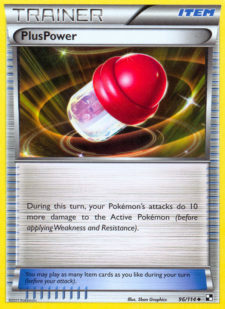 There are 6 prizes and I run 6 Pokémon, 1 Revive allows for a bit of flexibility, but doesn’t clog up the deck. Pokemon ParadijsThe last drop was a bit harder, but not a real heart breaker. I cut a Crushing Hammer to get us back down to 60. I find Crushing Hammer to be… useful, but rarely game changing. You really need to hit multiples in a row for it to make a huge impact on the game outside of the first few turns. My overall impressions of the deck are it’s solid, but kind of a gimmick at the same time. On paper it looks like it has an amazing Zekrom/Eelektrik matchup, but in reality I don’t think the match up is much over 50%. The CMT and Durant matchup I find challenging, but winnable at the same time. The deck is going to see enough play, so it’s a good idea to be familiar with the deck and how to play against it, but I really don’t think I have enough faith in the deck right now to play it in a major tournament. The players that are doing well with it seem to be very good players that would have performed well with one of the other major archetypes in the current format. Perhaps I have too much faith in Curran Hill, but I’m pretty sure that kid could win a States with a starter deck. Pokemon ParadijsAfter the first two weeks I’m feeling pretty good about my performance and how my deck played. I’m also keeping myself in line and making sure I stay grounded. I’ve put myself in a great position to secure a Worlds Invite, but I don’t have it in my hand and I still have plenty of time to blow it. I know that might not sound like the most positive attitude, but some of the worst losses I’ve seen in this game are because a player got cocky. If you’re having a good season or a bad season so far, remember we still have a States, a Regionals, Battle Roads, and Nationals to go, which is a lot of tournaments to get yourself in the position you want. I hope you enjoyed the article and found some good information you can apply. I also just want to take a minute and wish you good luck heading into this last weekend of States.